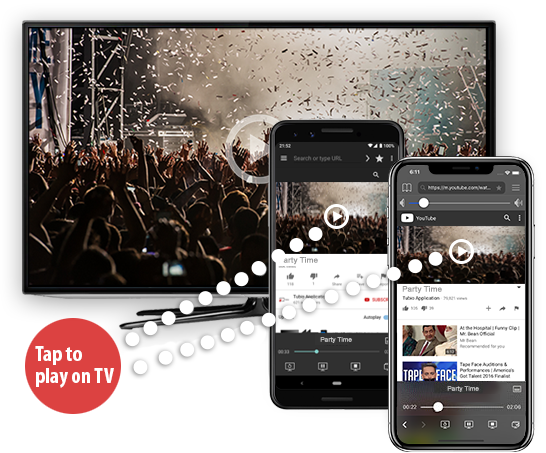 Stream web videos and music from your phone to TV. Easy as play. Tubio streams to any TV connected on the same Wi-Fi network. Instantly and in HD. No pairing, no dongle, no setup. Just your phone and TV connected over the same Wi-Fi network. One-touch play, pause, stop and seekbar to control playback from the screen of your phone. Supported TVs: DLNA-enabled TVs by Samsung, Sony, Panasonic, LG, Toshiba and Philips. Apple TV, Chromecast, Nexus player, Android TV, Roku, Amazon Fire TV. Contact Us: support@tubioapp.com © 2015-2019 AE Software. All Rights Reserved.